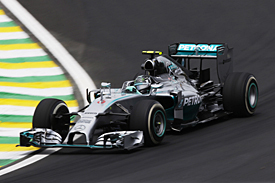 11:50 Welcome to AUTOSPORT's live coverage of free practice for the Brazilian Grand Prix. 11:52 As usual the weather at Interlagos is expected to play a part over the course of the weekend, but right now there's no sign of any rain. 11:53 With the world championship fight guaranteed to go to the final race in Abu Dhabi, the Lewis Hamilton/Nico Rosberg battle for glory took a back seat on Thursday, as the paddock was rife with talk about the driver market. 11:54 From the shock of Sauber announcing Williams test driver Felipe Nasr as one of its drivers next year (despite Adrian Sutil believing he has a contract with the team), there has been yet more speculation on the futures of several other drivers. 11:55 Fernando Alonso says there is no deadline for him to confirm his future, while Jenson Button - who many believe is going to lose his seat to the Spaniard at McLaren - dropped the firmest hints yet that he could be leaving Woking for 2015. 11:56 Further down the grid, Romain Grosjean and Sergio Perez believe they will be able to announce their 2015 plans sooner rather than later - possibly as early as this weekend. 11:57 For now all of that talk can take a back seat, though, as the countdown to the first track action of the weekend in Brazil is well and truly on. 12:00 The green light comes on the begin the session and Lotus's Pastor Maldonado is first out. 12:01 Also hitting the track rapidly are Friday testers Max Verstappen (Toro Rosso) , Felipe Nasr (Williams - for now) and Daniel Juncadella (Force India), plus Romain Grosjean, the Ferraris, Felipe Massa and Daniil Kvyat. 12:02 The first few cars to leave the pits stopped for practice starts before joining the track, but the pit exit lane got a bit too busy for those that followed. 12:02 Button has stopped just after negotiating his way through the pit entry. 12:03 The McLaren is getting a push from marshals to get him over the white line to get him officially into the pits. Now his mechanics are making their way down to him, and they take over pushing duties. 12:04 All 18 cars have managed an installation lap or two and headed back in. 12:04 On-board replays suggest Button's car shut itself down as he was slowing on approach to the pitlane speed limit line. 12:04 Maldonado is asked to perform a DRS check, and he confirms that it's not working. 12:05 Button on the radio: "Everything's just shut off - everything's just switched off. All the power, everything's gone." 12:07 All quiet on track for now, everyone back in the pits eight minutes into the session. 12:08 @pirellisport: "Objective for FP1 will be to run the medium tyre and find out more about what the new asphalt is like." 12:09 Kevin Magnussen is the first man back out in the functioning McLaren. 12:10 Magnussen's car is sporting some big aero sensors behind the front wheels. 12:11 Unsurprisingly the Dane doesn't go for a flying lap with what looks like some shopping trolleys attached to his car. He pits again. 12:14 The Toro Rossos and Sutil's Sauber are on track again now. 12:15 Verstappen runs wide into Turn 1, gets a wheel on the grass and then gets out of shape before gathering it all up for Turn 1. 12:16 Verstappen completes the lap in 1m19.999s to set our first time. 12:16 The Toro Rosso tries to bite Verstappen again in the long 'Laranjinha' right-hander. 12:17 Verstappen's next lap is a 1m17.712s, 2.6s up on early times from Sutil and Kvyat. 12:18 Sutil goes off at the same place Verstappen had trouble. The brand new surface here is not giving much grip as the first cars start to clean it up. 12:19 Kimi Raikkonen beats Verstappen by three tenths to go quickest, with Alonso then beating his team-mate to make it a Ferrari one-two. 12:19 The Ferradura/Laranjinha combination (Turns 6/7 in F1 speak, probably), is proving particularly troublesome at the moment. 12:20 Kvyat sticks his Toro Rosso in between Alonso and Raikkonen in second. 12:20 The two Mercedes kick off with slow laps in seventh and 10th places. 12:21 Sutil jumps to second in the Sauber, 0.274s behind Alonso. 12:21 Rosberg's second lap puts him fastest on a 1m15.450s. 12:21 Improvements from Friday guests Nasr and Verstappen move them into second and third behind Rosberg. 12:21 Hamilton comes through 0.113s faster than Rosberg to take first place with a 1m15.337s. 12:22 Juncadella - on reserve duty for Force India in this session - is the latest driver to lose the back end at Laranjinha. He had a minor twitch on the way in, but couldn't catch it before it turned into a full-on spin. 12:22 Alonso moves back into third place. Constant improvements through the field as drivers settle into the revised track. 12:22 That spin has wrecked Juncadella's first set of tyres. Fortunately, those were only eligible for use for another seven minutes. 12:22 Kvyat takes third from Alonso. 12:22 Now Raikkonen takes third from Kvyat. 12:22 Nasr is complaining of low grip. 12:23 BEN ANDERSON is down at Turn 4 for us at the moment, and he says cars are sparking over the bumps as they approach the braking zone. 12:24 Rosberg now reclaims the top spot from Hamilton with a 1m5.002s, that's 0.335s faster. 12:24 Nasr brings his Williams back into fourth, between Raikkonen and Kvyat. 12:24 Grosjean gets out of shape and takes a trip through the run-off at Laranjinha. 12:24 Hamilton is responding to Rosberg, setting a new benchmark pace in sector one. 12:25 Ricciardo pops the Red Bull up to third, four tenths off the pace. 12:25 Rosberg: "Generally too much understeer." 12:25 Hamilton is quicker in sector two as well, but Rosberg is faster still in sector one on his next lap. 12:25 Hamilton jumps clear with a 1m14.172s, nine tenths faster than Rosberg but his team-mate is improving too. 12:26 Hamilton proves Rosberg's point by running wide over the kerb (and a bit of the grass) on the exit of Mergulho. 12:26 Raikkonen briefly appeared in second between the Mercedes before Hamilton finished his lap, but is already back to fifth behind Grosjean and Vettel. 12:26 Rosberg, helped by Hamilton's messy last sector, takes the top spot back by 0.171s with a 1m14.001s lap. 12:27 Both Red Bulls find more time, bringing Vettel and Ricciardo into third and fourth. 12:27 Kvyat is hanging on to the Toro Rosso through the final sector. 12:27 The improvements keep coming: Kvyat and Alonso go third and fourth, demoting the Red Bulls moments after they took the places. 12:28 Hamilton puts in a 1m13.468s to go quickest by six tenths over Rosberg, who is back in the pits. 12:28 A comparison of world champions from BEN ANDERSON at Turn 4: "Vettel looks nicely committed, very smooth. Alonso hasn't found the groove yet and is stabbing at the throttle." 12:29 Hamilton is informed of the gap to Rosberg, and told that there is a lot of track evolution. 12:31 Button's car has been roped off, with only three mechanics anywhere near it at the moment. The McLaren also has a 'DANGER' light flashing on it. 12:34 Magnussen, one of the drivers yet to put a lap in, heads back out. 12:36 Alonso is chatting to his engineers (and Ferrari junior Raffaele Marciello) in the garage, while over in the Red Bull garage Ricciardo has a team headset on. 12:36 Magnussen's car is spitting out lots of sparks as the car scrapes along the ground. 12:37 "You've got clear track - we're going to be doing five timed laps," Magnussen is told. 12:39 Vergne - who has handed his car over to Verstappen for this session (and still hopes to be the Dutchman's team-mate next year), is on the Toro Rosso pitwall at the moment. 12:41 Magnussen's run puts him third fastest. 12:41 Some of the big teams are probably missing minnows Caterham and Marussia today. That's four fewer cars available to clean this slippery new track surface for them. @MercedesAMGF1: "@LewisHamilton commenting on how smooth this new surface is. The traditional Interlagos bumps seemingly now less severe"
12:43 Over at Turn 4 BEN ANDERSON informs us that Magnussen is "pressing on a bit now". The Dane is short-shifting out of the corner to combat wheelspin. 12:43 Magnussen is experimenting at the moment. He decides against a short-shift next time around. "Vergne will be disappointed to to miss another FP1 for Verstappen. Last year he and Ricciardo alternated to make way for Kvyat, and he'd hoped they'd do the same this year for their latest rookie. "It seems Red Bull feels Kvyat still needs the track time given his relative inexperience." 12:50 Verstappen jumps into second place in the Toro Rosso, four tenths off Hamilton's time. "Once upon a time the high altitude – and less oxygen – gave engines an easier ride as less power was produced, but it now works against us. "Ambient air is pressurised to the same level inside the turbocharger and compressor so the same amount of oxygen is always inside the engine. "The other 'high altitude' races such as Spa and Austria are considered interim tests, but at 800m above sea level Interlagos is another step." 12:53 Bottas is on the Williams pitwall for this session, while new Sauber signing Nasr gets another run in the Finn's car. 12:54 Kvyat got well out of shape in Turn 3, having unsettled the car on the inside kerb. He fought hard to keep it on the track, but had to take to the run-off briefly. 12:55 Rosberg sets a new best time of all in the final sector but remains third behind Hamilton and Verstappen. The Dutchman is improving too. 12:55 Hamilton begins his latest lap with a new sector one benchmark. 12:55 Raikkonen jumps from the midfield up to sixth place. 12:55 More dramas for the other Toro Rosso, as Verstappen has a half-spin at Mergulho but manages to keep it going. He asks if there is any damage to the front wing, as it seemed to scrape along the rough kerb on the inside. 12:56 No improvement for Hamilton overall on that lap. Rosberg is now going quicker than before in the early sectors. 12:56 Rosberg takes first place back from Hamilton with a 1m13.122s, three tenths faster than his title rival. 12:57 Hamilton: "Rears are over-heating a lot." The team confirms that it can see that from the data. 12:57 Gutierrez is getting ready in the Sauber garage as his crew puts the finishing touches to his car. 12:58 Latest leap forward is from Maldonado, who goes fourth, just as Raikkonen improves to fifth behind him. 12:58 Magnussen's sparks explained by @McLarenF1: "Kev's been testing titanium skid blocks during this morning's session - hence the sparks!" 12:58 Rosberg goes quicker again in the first sector. Hamilton is also still out but not improving. 12:59 Rosberg increases his advantage to just over seven tenths of a second with a lap of 1m12.764s. 13:00 @WilliamsRacing: "Main focus this morning is to start gathering tyre information on the new asphalt. Both drivers reporting low grip after their first runs"
13:01 Juncadella has crashed the Force India. 13:01 Hamilton finds time too, but he's still 0.221s off Rosberg with his 1m12.985s. 13:01 The DTM driver has gone off at Turn 8, straight-on. 13:01 Juncadella climbs out of the car, and the session is stopped. 13:02 Rosberg was on a quicker lap just as that red flag came out. He had completed a faster first sector than before. 13:02 Juncadella clipped the outside kerb out of Laranjinha, which kicked the Force India into a twitch as he approached the braking zone. He then locked up, and couldn't stop the car slamming into the barriers. 13:03 An anxious Perez looks on from the Force India pit, hoping his car can be fixed in time for FP2. 13:08 Button is still in the McLaren garage keeping an eye on the progress being made with his car - which shut itself down at the end of his first lap of this session. 13:09 The session resumes with 20 minutes left and Hamilton and Gutierrez are first out. 13:12 Massa gets off-line through Mergulho, and he has to scramble to keep the car pointing in the right direction. 13:12 The Williams continues to make Massa work hard as he locks a wheel into Turn 1. 13:15 Alonso is one of the few drivers improving at the moment, going up to ninth. 13:15 Though Gutierrez's Sauber is running again after earlier troubles, it hasn't yet done a flying lap, just four in/out runs. 13:16 @SauberF1Team: "We sent Esteban out, but had to call him back as the problem is not solved yet"
13:16 Massa puts in better sector one and two times, but the last part of the lap isn't an improvement and he stays 13th. 13:17 Kvyat is another man improving his sectors but not the complete lap. He's seventh. 13:18 Alonso now jumps up from ninth to third, a second off Rosberg. 13:18 Verstappen says his car is behaving much better now - "It's much easier to save the rear tyres". 13:18 Button has zipped up his race suit, but with 11 minutes to go it's got to be unlikely that he'll be back out. 13:19 Verstappen has taken a detour at Turn 1, rejoining from behind one of the barriers. 13:19 Another change for third as Kvyat pops in ahead of Alonso, beating the Ferrari by 0.019s. 13:20 Verstappen had a huge lock-up which took him through a (very wide) gap in the barriers. He was briefly heading for a piece of the old Interlagos layout there, before finding his way back onto the modern version. 13:20 Massa gets Williams into the top 10 with a lap 1.6s off the pace to go from 13th to 10th. 13:21 Hamilton is told that his target laptime is a 1m16.0s. That's more than three seconds shy of his and Rosberg's benchmarks in this session. 13:21 Nasr does a better middle second but stays 15th in the Williams he's handing back to Valtteri Bottas at lunchtime. 13:22 Kvyat does faster first and third sectors, but doesn't find any time in the middle so his current third-place lap stands as his best. 13:22 Alonso goes off at Bico de Pato. He locked up on the way in, but couldn't prevent the car from running wide onto the grass. We then get a replay of him grappling on the same kerb that spat Juncadella into the barriers earlier. 13:23 Button has his helmet on, so it looks like he is going to get a short run at the end of this session. Less than seven minutes remaining for McLaren to get him on track. 13:23 Massa nips up to ninth in the Williams, 0.011s ahead of Ricciardo in 10th. 13:24 Nasr improves from 15th to 12th. He's 0.336s behind team-mate Massa. 13:26 Raikkonen is the latest driver to spin at Laranjinha. 13:26 Raikkonen was on a better lap prior to that spin, as was Nasr, who would've encountered the yellows for the Ferrari. 13:27 Raikkonen got quite far into the long right-hander before the Ferrari got away from him - compared to others who have gone off there. 13:27 Gutierrez might still be having problems. He's been back out, but pits again without doing a flying lap. 13:28 Massa leaps from ninth to fifth, slotting the Williams in 0.016s ahead of Verstappen. 13:29 Gutierrez is out of the Sauber, walking out of the back of the garage. 13:30 Alonso was quicker than before in sector one but encountered Magnussen's McLaren so this won't be an improvement. He stays fourth. 13:30 The chequered flag comes out, so Rosberg will end the morning fastest. 13:30 Button was sat in the McLaren, but the team have just missed the opportunity to get him out for even a single lap. 13:31 Alonso goes quicker than before in sectors one and two, but doesn't bother finishing the lap and pits. 13:31 Raikkonen is off again. This time he spun on the way into Juncao, having clipped the grass on the outside as he turned in. 13:32 Raikkonen chose the conventional method of rejoining the track this time, so no repeat of his excursions in the past at that corner that resulted in him finding a locked gate! 13:33 The latest 'Virtual Safety Car' test is now taking place. Part of that process includes cars being called in for pitstops - which Rosberg has just carried out. 13:33 Rosberg's best time was a 1m12.764s, 0.221s clear of Hamilton and 0.959s ahead of Kvyat in third. 13:41 So early honours to Rosberg on what has been a dry day at Interlagos up to this point, and problems for Gutierrez and Button. We'll be back just before 4pm UK time for the afternoon session. See you then. 15:48 Welcome back to AUTOSPORT Live for second practice at Interlagos, which is 12 minutes away. 15:54 On track this morning, Nico Rosberg was quickest ahead of Lewis Hamilton, with Mercedes again a fair margin clear of the rest. But in the silver cars' wake, third position changed hands pretty incessantly, and it was Daniil Kvyat who ended up there for Toro Rosso. 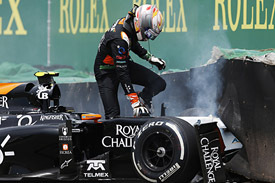 At the back, no flying laps for either Jenson Button or Esteban Gutierrez as technical problems plagued their sessions. 15:59 Completely dry and nearly sunny conditions at the moment, no sign of rain. 16:01 No rush for the drivers to get out onto the circuit as Esteban Gutierrez is the first driver to venture onto the track this afternoon. 16:04 Gutierrez does a 1m18.173s on his first flying lap as the Mexican driver looks to make up for the time he lost this morning. 16:05 Romain Grosjean usurps Gutierrez at the top with a 1m16.001s in the Lotus. 16:05 Pastor Maldonado now takes the top spot from his Lotus teammate with a 1m15.467s. 16:06 TV cameras catch Sergio Perez looking intent but forlorn on the Force India pitwall. 16:06 "I'm feeling vibrations on the front," reports Jean-Eric Vergne to Toro Rosso. 16:07 Jenson Button, another man hoping make up for time lost in FP1, completes his first flying lap of the day in 1m17.534s. 16:08 Romain Grosjean has a trip over the asphalt run-off at the Descida do Lago. No harm done and he resumes. 16:08 Another driver gathering info on the pitwall is Max Verstappen. Vergne may be back in the car, but the 2015 Toro Rosso driver is learning all he can. 16:09 While Perez sits this session out, Juncadella has been describing "the weirdest crash" of his career to BEN ANDERSON. 16:09 Grosjean reports that his Lotus is currently "a disaster", but wonders if it might just be down to tyre temperatures. 16:09 Adrian Sutil spins his Sauber into the Senna S.
16:10 Kevin Magnussen goes fastest with a 1m15.232s in the McLaren. 16:10 Grosjean is more and more convinced there's something seriously wrong with his Lotus, and continues to radio the team in some agitation. 16:11 Valterri Bottas improves to P2 but remains 0.033 behind Magnussen. 16:11 "Rear tyre temperature on the high side," Toro Rosso warns Kvyat. "Yeah, I can feel it a lot," replies the Russian. 16:12 Vergne has parked his Toro Rosso at the trackside. 16:12 Vergne hops out of his car, which has ground to a halt on the way out of the Descida do Lago. 16:13 Replays suggest Vergne parked on the team's instruction, getting a "stop the car on track JEV" message. 16:14 Red Bull tells Vettel to abort his run: "We're better off waiting for that car to be cleared. They might want to go red." 16:15 Marshals wearing safety gloves have gone out to Vergne's Toro Rosso, which is still stuck on the inside edge of the track. 16:15 The red flags do now come out. 16:15 It should be a very brief stoppage though, as the marshals have now managed to shift Vergne's car away. 16:17 Niki Lauda is joined in the Mercedes pit by fellow F1 legend Nelson Piquet for a chat. 16:17 Force India attempts to explain the stoppage to Hulkenberg: "They wouldn't touch that car so I think it must've got ERS unsafe. But now they have moved it, and they put the red flag out as they started to move it, so I don't know why that is." 16:18 The session restarts with 72 minutes to go. 16:18 Jean-Eric Vergne, Kimi Raikkonen and Lewis Hamilton are the only other drivers who have set a time so far. 16:19 Whatever Nelson Piquet just said to Niki Lauda in the Mercedes garage looked like it was quite amusing. 16:21 Sauber calls Gutierrez back into the pits as it is still having problems with his car. 16:21 Vergne makes his way back down the pitlane, helmet in hand. 16:22 Ferocious cleaning efforts are under way at McLaren, where an F1 car has inconveniently left tyre marks on the garage floor. 16:22 Nico Rosberg goes fastest with a 1m14.681s, taking the top spot that had briefly been held by Kimi Raikkonen. 16:23 Now Daniel Ricciardo goes fastest with a 1m14.499s. 16:23 Vettel neatly catches a couple of oversteer moments in his Red Bull. 16:24 Rakkonen back to the top. 16:24 He leads Ricciardo, Rosberg and Hamilton. 16:25 Rosberg fastest with a 1m13.572s. 16:25 "The rear's definitely more lively," Ricciardo tells Red Bull, which he demonstrates with a wild twitch. 16:26 In the other Ferrari, Alonso improves to fourth place. 16:26 Rosberg tells Mercedes he has "good bite on the brakes with the cold brakes." 16:26 TV cameras find a lady with particularly massive afro-style hair on the balcony above the pitlane. It's a remarkable size. Great effort. Must be a hassle in a downpour. 16:26 Hamilton paid a brief visit to the run-off area at the Senna S just now. 16:26 Ricciardo takes back the top spot with a 1m13.546s. 16:27 Vettel reports quite high wear on both right-side tyres. 16:28 Massa has moved into P4 ahead of the Ferrari duo and behind Rosberg. 16:29 Hamilton was passed by a couple of cars while on a slow lap, and had a very close near-miss with Raikkonen, having to climb the kerb to get out of the Ferrari's way. 16:32 Perez won't be running after Juncadella's morning crash. 16:32 Hamilton leads with a 1m13.072s. 16:34 Lotus gives Grosjean a setting instruction for his next timed lap. "Why?" he replies a bit indignantly. He's promised an explanation later. 16:34 Nico Rosberg is 0.203s behind Hamilton in second place. 16:35 Red Bull team boss Christian Horner is finding time to hold a Twitter Q&A with fans mid-session. We don't want to know what the question that just prompted the answer "I have a lucky loo at each circuit!" was. 16:35 "The track is really, really difficult to drive right now in those temperatures," pacesetter Hamilton tells Mercedes. 16:37 Mass, slightly tense, confusion on the Lotus radio between Grosjean and his engineers over whether he should be pushing, cooling or pitting. 16:38 A big lock-up into the Senna S suggests Grosjean has now decided to push hard. 16:38 The suspension of Perez's very dismantled Force India is getting a polish. There's a 'Henry' hoover underneath too, so it'll definitely be thoroughly clean for him when fixed. 16:39 Toro Rosso tells Kvyat that most of the problems he's experienced so far this afternoon are down to tyre temperatures varying. 16:40 Perez's pitwall body language now has a bit more boredom about it. 16:41 Ricciardo slithers over the run-off at the Senna S.
16:41 Ricciardo moves to P1 with a 1m12.956s. 16:42 Ricciardo's mistake came just moments after his took the top spot. It prompted a bit of rueful chin-rubbing from Christian Horner. 16:44 Ricciardo is one of the first drivers to try the soft tyre today, and it found him 0.6s for that first place lap. 16:45 Hamilton sits in second place, just 0.116s behind Ricciardo with Rosberg just over two tenths of a second further back. 16:45 Sauber orders Gutierrez to stop his car (again). 16:45 "It looks like the same [MGU-]K problem," Sauber mournfully tells Gutierrez. 16:46 Nico Rosberg uses the soft tyres to go fastest with 1m12.123s. 16:46 Hamilton runs very wide through Mergulho. 16:46 "There is some serious stuff going wrong," Vettel tells Red Bull, who is sure "something is not working" on his car. 16:46 Hamilton, also on the soft tyres, is 0.599s slower than Rosberg in P2. 16:47 Daniil Kvyat jumps up to P4. 16:48 "Do you want to box or go for another lap, Nico?" asks Mercedes. "Errrr," replies Rosberg, then pauses for...ages... then asks what others are doing. 16:48 Felipe Massa improves to P4 with the soft tyres. 16:49 Kvyat locks up and gets a little sideways into Turn 8. 16:49 A slight lock-up from Button at the Senna S on his lap too. 16:50 Valtteri Bottas now moves ahead of Massa into P4 after switching to the soft tyres. 16:51 McLaren recommends Magnussen pits as it doesn't think other cars are improving as they go further into their stints. 16:51 Massa improves his time, but stays in P5. 16:51 Lewis Hamilton closes the gap to Rosberg to just over two tenths of a second. 16:52 That lap from Massa was a little hairy through the middle sector. 16:52 Hamilton has a big lock-up into the Senna S after that lap and then sails over the run-off area. 16:53 Fernando Alonso in P6, is the last man within a second of Nico Rosberg's time. 16:53 Button's feedback to McLaren includes an ironic "also we seemed to have the whole field behind us when we started our out-lap..."
16:53 Mercedes tells Hamilton that "it looks like it's a 'lap one' tyre", as in, you'll only have one shot on it in Q3. 16:54 Hamilton was on course to go fastest but heads into the pits instead. 16:54 Hulkenberg tells Force India he has "a lot of understeer". 16:55 Raikkonen improves to P3, 0.573s behind Rosberg. 16:56 Lotus tweets that Maldonado has pitted "for some sun tan lotion". It's probably fibbing. 16:58 Grosjean and Lotus continue to bicker over the radio about the order of fast laps and cool-down laps required. 16:58 "I've got a sudden torque increase out of Turn 4," Rosberg tells Mercedes. 16:59 Raikkonen has a lengthy trip over the grass at the final corner. 17:00 A replay of Raikkonen's incident shows he got a bit squiffy under braking, locked up, headed down the escape road, had some 2012 race deja vu about finding a closed gate at the end, then drove back over the grass, rejoined and headed for the pits. 17:02 Everyone currently running is on softs, all doing longer/heavier runs to check race settings. 17:02 Vettel lets Red Bull know that "the clutch was nowhere" as he began his latest run. 17:03 Rosberg lapping over 3.7s slower than his fastest time. 17:05 "Looking after that right rear," Mercedes says to Rosberg, before giving him some wind-related information. 17:05 Alonso parks his Ferrari with a fire at the rear. 17:05 Romain Grosjean has done the most running so far this afternoon, completing 26 laps in his Lotus. 17:06 The red flags come out for the Ferrari to get attended to. 17:06 Alonso ran to get a fire extinguisher himself to deal with the moderate blaze at the back of his car. 17:07 Alonso had parked on the Reta Oposta straight heading towards the Descida do Lago. The fire was brief but looked unnerving. 17:07 The Ferrari is now covered in extinguisher foam and still awaiting recovery. 17:08 Alonso's hurry to get the extinguisher was probably became he read about what happened to erstwhile European Rally Championship contender Sepp Wiegand's Skoda earlier this week. Or maybe not. 17:09 Still no activity around the stranded Ferrari and no indication when the session will resume. Marshals are presumably waiting for a suitable recovery vehicle. 17:10 A flatbed truck now arrives behind Alonso's car to return it to the pits. 17:12 Replays suggest that was a proper old-fashioned engine failure on Alonso's Ferrari, with some puffs of smoke out of the Sol curve followed by a substantial cloud of smoke, then the fire. Retro. 17:13 The session will restart with 16 minutes left. 17:14 We're back to green, quite a queue waiting at the end of the pitlane. 17:15 The clouds above the circuit are now quite dark, though it would be a surprise to see rain before the end of the session. Some soggy interviews are possible instead. 17:16 Alonso and his ample beard arrive back in the pits grinning, so he's not too fussed about the engine problem. 17:16 Apart from the stranded Jean-Eric Vergne, unfortunately for the Brazilian fans, it's local hero Felipe Massa who has completed the fewest number of laps so far this afternoon, with just 17 completed. 17:17 Gutierrez has now parked in a similar place to where Alonso was. 17:17 Gutierrez has stopped closer to the pit exit than Alonso was and further onto the grass, so this might be easier to clear. 17:18 The red flag is back out to retrieve Gutierrez's Sauber. 17:19 Replays show Massa coming out of the Williams garage into Raikkonen's path just before this stoppage. 17:19 Gutierrez's message to Sauber just before he parked was "no power". 17:20 Button: "The vibrations aren't the same as at other races. There's proper bouncing, you can really feel it through the steering wheel." 17:20 The Sauber is cleared away and the session will resume with nine minutes to go. 17:21 Back to green and time for a few more runs for everyone. 17:22 "OK Felipe, we'll just run to the end of the session," is the message to Massa, "we should have time to do seven or eight timed laps." 17:23 Bottas heads the pack on track, but does not improve his time and stays in P5. 17:25 Weather advice from Pirelli: "Temperatures getting higher here, but let's just say this: don't forget your umbrellas tomorrow..."
17:26 Hamilton pops a wheel on the grass approaching Juncao but gathers it up without doing any Raikkonen-style run-off exploration. 17:27 Several drivers, including the Mercedes, have switched back to medium tyres for this stage of long-run testing. 17:30 Kvyat declares his Toro Rosso, or its tyres, "undriveable". He's told to stick it out for the final minute. 17:30 The chequered flag comes out. 17:31 Kvyat wonders if something is actually broken on his car: "I can't take the easy flat corners flat, so something is wrong". 17:31 The field will now participate in another virtual safety car test. 17:32 Hamilton says he's coming in, is told to do the VSC test, replies that he doesn't need to then is firmly told that yes, he does. 17:33 The final gap between the two Mercedes drivers at the top of the field is 0.213s. 18:13 Hamilton tells the media after the session that the red flags affected his running today, but it shouldn't cause much of a problem for the rest of the weekend. When asked if he put a clean lap together, he said: "No I didn't. There were quite a few red flags at the end so we didn't get the best of long running, but it's the same for everyone. "The car feels OK, there are some improvements we can make. It wasn't the best of days - I didn't put together a good lap, but that will come tomorrow hopefully." 18:17 It's a tale of two moods at Red Bull - Vettel sounds miserable, while team-mate Ricciardo reckons he's in good shape. Vettel: "I don't think we've had too many Fridays that were trouble free. All in all we didn't get that much running due to the red flags. "We are still fighting and trying to improve. There are still some things we need to work on. If we get everything right we should be in a reasonable place." His chirpy team-mate Ricciardo says "early signs are good" based on today's running, though. We'll have more on why he's so upbeat on autosport.com shortly. 18:18 That brings an end to our live coverage from the first day of running ahead of the Brazilian GP. We'll be back tomorrow, kicking off with FP3 at 13:00 UK time. See you then.